This science tricorder is true to Star Trek: The Original Series. Features the voice of Leonard Nimoy, plus lights and other sounds. Incredibly detailed, with removable scanner accessory. It's perfect for your next away mission! Mr. Spock's favorite instrument! This authentic role-play plastic toy replica is based on the classic 23rd-century design. 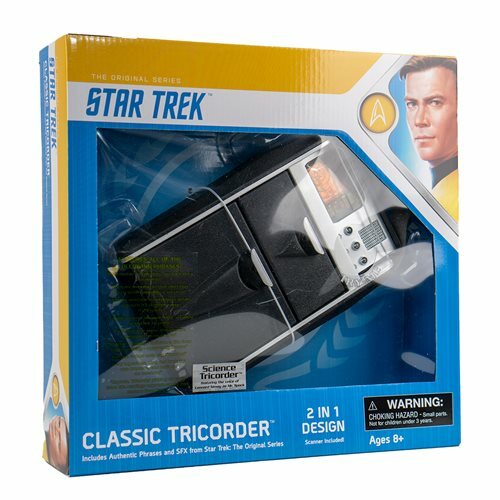 The 1:1 scale Electronic TOS Science Tricorder features silver highlights over a black finish, as well as the voice of Leonard Nimoy and light and sound effects taken from Star Trek: The Original Series. Also included are a removable scanner accessory and window-box packaging. The Tricorder runs on 2x "AA" batteries. It's perfect for your next away mission!